It's a treat and an ornament all in one. Blue and white paper. 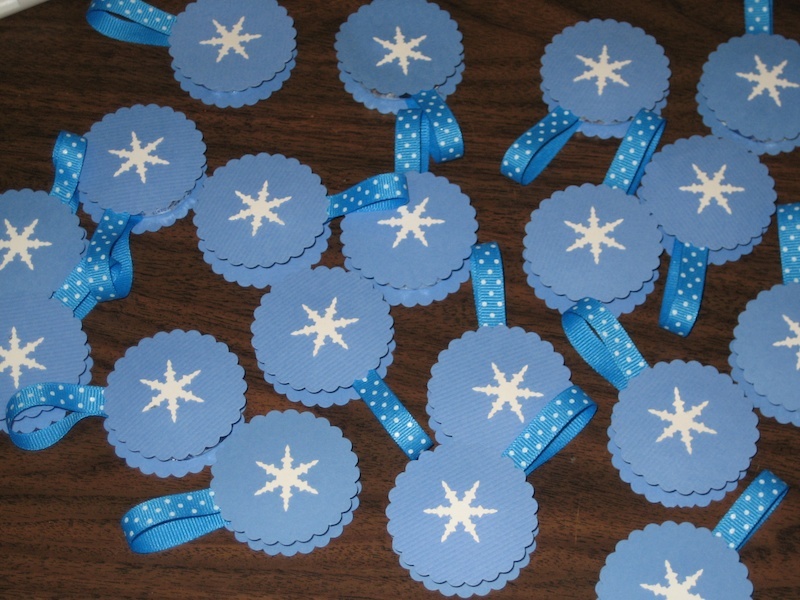 Some small peppermint patties. A glue stick. Ribbon, about 5" per patty. 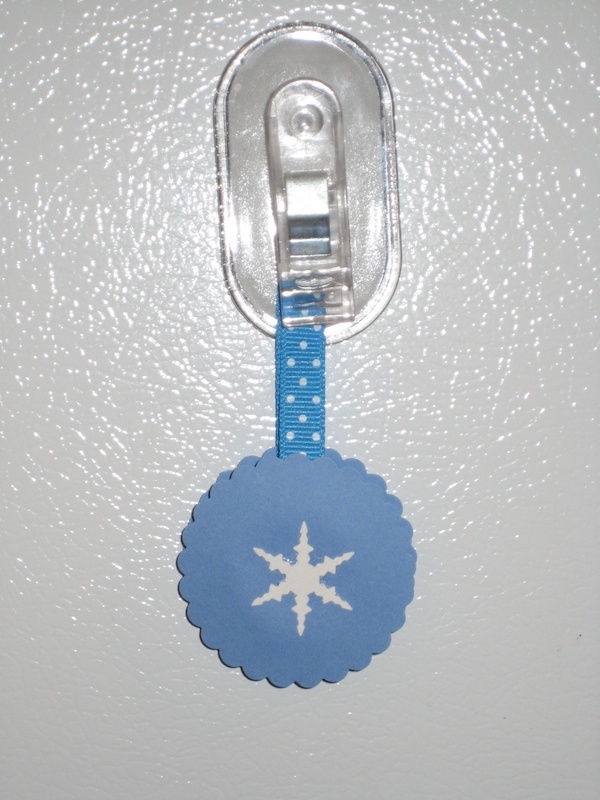 A snowflake punch (or snowflake stickers). A 2" scallop circle punch. Substitute whatever supplies you have to make it work for you. Do red circles and green trees. Make birthday favors with cakes or flowers. 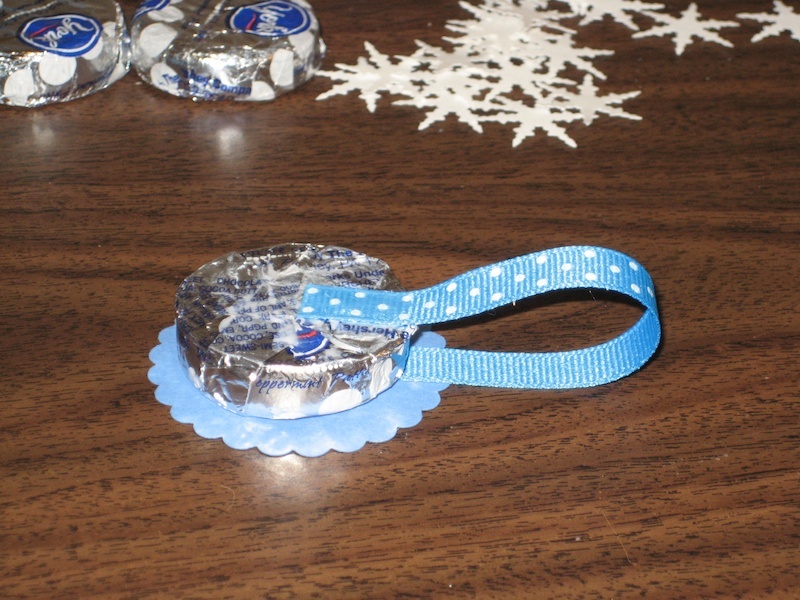 Put glue on the peppermint patty wrapper, stick on the ribbon, stick on the circle. Repeat on the other side. 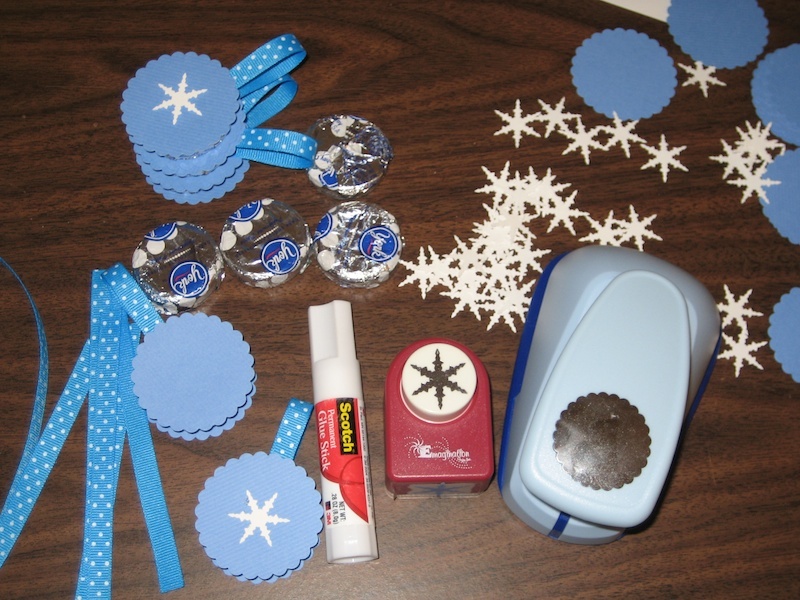 Glue on the snowflake. Make s slew of 'em and attach them to your christmas packages. Or hand them out at parties. Or give them to your kid's class. Feeling motivated? Make 'em next year for Halloween. A great project for kids, too. Oh, makes me want to have a holiday party, just to give these out. This is really clever! I have a Chrismakkah these days and this way I can make all sorts of Christmas and Hannakkuh shapes to go around the patties. (Though those snowflakes are really perfect.) Thanks for such a great idea! Great idea! But when will I have time to make them is the inportant question. I made Christmas cakes in 3 sizes today, same recipe and shapes as the Wedding Cake. And tomorrow I have to get started on my annual Christmas letter for all the cousins. Update: the stores were out of snowflake punches! Argh! I have stickers instead. I'm also using wrapping ribbon because it's cheaper. Mine will be the generic brand of your ornaments. So cute and a great idea. Reminds me I haven't had a York Peppermint Pattie in ages!